Ukraine's tug-of-war between Russia and the West lurched to the central southern coastal city of Odessa on Friday, with around a thousand rival protesters involved in violent clashes in the city center. A demonstration calling for the country's unity marched through the streets and was met by pro-Russian activists, Kiev-based UNIAN news agency and the Ukrainian online newspaper Ukrainskaya Pravda reported. Riot police stepped in as the crowds threw flares and light bombs, and fired stones in slingshots. The English-language Kiev Post reported that one person had been killed in the clashes, showing a photograph of a body wrapped in the Ukrainian flag. The Kiev Post said most of the pro-Russian group were fans of the local football team. 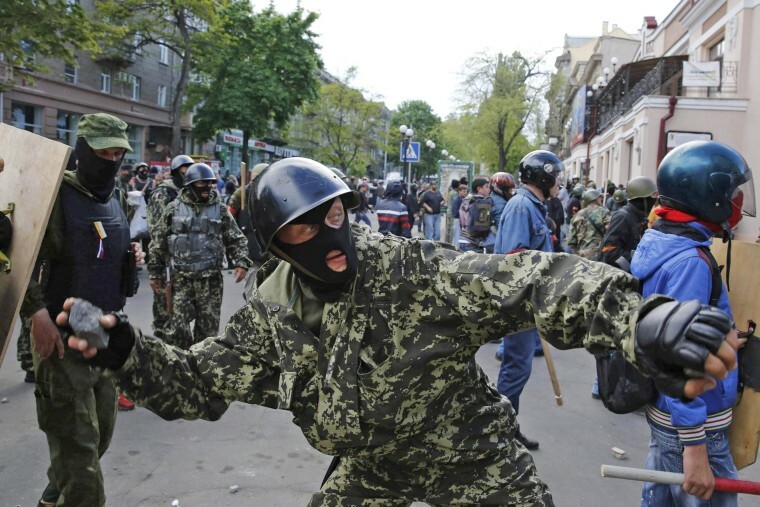 The flare-up came as Ukraine troops were attempting to drive pro-Russian separatists out of Slovyansk, one of several cities across the east occupied by protesters opposing the new Kiev-government. Like Slovyansk and the Russian-annexed peninsula of Crimea, Odessa has a significant number of Russian speakers and played a prominent role in Russian history. All of these regions formed the power base for former President Viktor Yanukovych, whose ouster lead to the formation of the current administration in Kiev. Video footage of the clashes showed riot police attempting to control the crowds, some of whom had masks, shields, and clubs, similar to those seen in the violent Kiev protests that led to the fall of Yanukovych in February. The video, which could not be independently verified by NBC News, shows members of the crowds throwing rocks into clouds of tear gas, as loud bangs reverberating through the streets.